DIE Lunæ, videlicet, 13 die Junii. Letter from Lord Willoughby of Parham to the E. of Essex, desiring to know if the Lord Keeper voted against the Ordinance for the Militia. The King's Letter to Lord Willoughby of Parham, to desist putting the Militia in Execution. Message to the H. C. for a Conference on these Letters, and about the Lord Lieutenans going to Ireland. Letters and Papers relative to Lord Willoughby in Lincolnshire, read. and for a Conference about the Lincolnshire and Leicestershire Militia. Message to the H. C. for Information about the Somersetshire Petition against the Proceedings of Parliament. Report from the Committee in London. Lord Willoughby to take Possession of the Magazine at Lincoln. Sir P. Tirwit and Sir W. Pelham sent for as Delinquents. E. of Essex to answer Lord Willoughby's Letter. City of London to present Names of Persons who oppose the Militia. Committee to receive the Answers of absent Lords, about the Propositions for raising Money and Horse. Poxton sent for, for printing a false Paper about L. Wharton. Committee to examine how the Lord Keeper voted about the Ordinance for the Militia. Lord Keeper's Letter to Lord Willoughby, that he voted against the Ordinance for the Militia. Brockelesby, this 4th of June, 1642. King's Letter to Mr. Booth, of Killingline, not to leave Lincolnshire. Instructions for the Committees going into Lancashire. Subject of the Conference, concerning the Lord Lieutenant of Ireland's Departure. 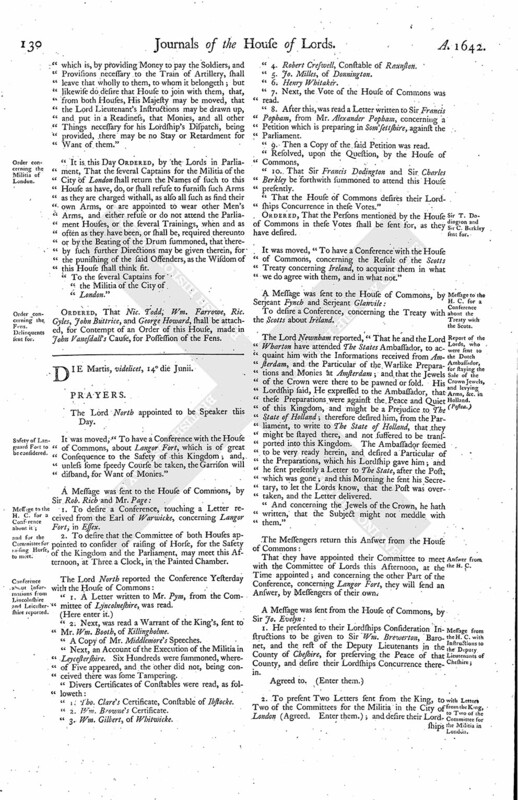 Order concerning the Militia of London. Order concerning the Fens. Delinquents sent for. The Lord North was appointed to sit as Speaker this Day. "He desires to be informed certainly, whether the Lord Keeper gave his Vote for the Passing of the Ordinance concerning the Militia; His Majesty laying it upon his Lordship's Ignorance: He hopes to give a good Account for the putting the Militia into Execution." Next, a Copy of the King's Letter to his Lordship was read. "Right Trusty and Well-beloved, We Greet you well. Though We could not but rest much unsatisfied that Our last Gracious Letter could work no better Effects in you, but that you remain still obstinate in pursuing those illegal Commands you have received from both Houses; yet, since We perceive that you have some colourable Excuse for this your great Error, upon the mistaking of what was the Opinion of the Lord Keeper and the Lord Chief Justice Banks upon this Particular, the One having voted clearly against it, and the other having never declared his Opinion therein, it having never been sought, and to this Hour having done nothing in the Prosecution thereof, as by their several Letters will most clearly appear unto you: Therefore We are pleased once again to lay Our Commands upon you, that, seeing the Grounds whereon you build your Error hath been thus mistaken by you, We cannot doubt of your Obedience in retiring from these unlawful Ways you have suffered yourself to run into by this Mistaking: As likewise We cannot but observe unto you the strange exorbitant Power which the Two Houses at this Time, misled by a few factious malicious Spirits, pretend to arrogate to themselves, and by which the Militia (as they call it) is put in Execution; it being so supreme and absolute, that Our Consent is not thought necessary for the Execution of any Thing they judge to be convenient for the Welfare of the Kingdom, of which as We hope you are ignorant, so doubt not but, it being made known unto you by Us, it will be more than a sufficient Ground to make you desist from those illegal, undutiful, upon so much Knowledge by Warning, and (therefore) unsafe Ways. "Given at Our Court at Yorke, the 7th of June, 1642. "To the Lord Willoughby of Parham." Ordered, To be referred to the Consideration of the Committee of both Houses, to draw up the Declaration concerning Beckwith. To desire a Conference concerning Letters received from the Lord Willo. of Parham. Secondly, Concerning the Lord Lieutenant's going for Ireland. Next, the Copy of the Lord Keeper's Letter, written to the Lord Willoughby, was read; and divers other Letters written to his Lordship: One from Sir Wm. Terwitt, who denied to deliver the Magazine of the County of Lyncolne, which was under his Custody, to the Lord Willoughby, though he was served with the Order of Parliament. Wm. Booth, the King's Warrant to him. 1. To represent to their Lordships some Instructions to be given to a Committee of their House, to be sent into Lyncolneshire, and desire their Lordships Concurrence therein. Agreed to. (fn. 1) To be Deputy Lieutenants for the County of Kent. Agreed to. To be Deputy Lieutenants for the County of Warwicke. 3. To desire a Conference, concerning some Informations received touching Proceedings in the Execution of the Militia in Lyncolneshire and Leycestershire. The Effect of what should be delivered at this Conference touching the Earl of Leycester's going for Ireland, was read, and approved of by this House. To desire that, at this Conference, the House of Commons may impart to their Lordships the Particulars concerning a Petition which is now in framing in Som'settshire, against the Proceedings of Parliament. Ordered, That this be a Part of this Conference. The Lords Committees that went into London on Saturday last reported, "That they gave the City Thanks for their chearful lending of the One Hundred Thousand Pounds to the Parliament, for the Occasions of Ireland; and likewise have communicated to them the Propositions, which (fn. 2) they received with much Readiness; and also they acquainted them with the Informations from Amsterdam, concerning the Warlike Preparations prepared there for the King." Ordered, That the Lord Willoughby of Parham shall take into his Custody the Magazine of the County of Lyncolne, in the Hands of Sir Phillip Terwitt and Sir Wm. Pelham, according to the former Order of this House; and Sir Phil. Terwitt and Sir Wm. Pelham to be sent for, as Delinquents. The Earl of Essex is to write to the Lord Willoughby, That the House hath Ordered, That he shall send for the Magazine of the County, according to the Order; that the House is satisfied that the Lord Keeper accepted his Deputation, and nominated his Deputy Lieutenants; and for further Satisfaction, a Committee is appointed to search the Book, concerning his Vote to the Legality of the Militia." Information was given to this House, "That the City of London do intend to draw out a Regiment to train once in Two or Three Days, but they find in some Wards some that do oppose the Militia; therefore it was desired that they might have Liberty to Present the Names of such as they shall discover to be Opposers to the Militia;" which was Ordered accordingly. All the Letters read this Day, concerning the Lord Willoughby and that Business, shall be read now at this Conference; and to let them know, that this House resolves, That the Lord Willoughby shall send for, and take into his Custody, the Magazine of Lyncolneshire; and the Paper concerning the Lord Lieutenant of Ireland, to be communicated to the House of Commons. Ordered, That the Writ of Error between Lenthall and Breuton shall be argued To-morrow. House adjourned during Pleasure, and the Lords went to the Conference. House resumed. This Report to be made To-morrow. Ordered, That the Lords Committees appointed to take the Answers of those Lords that are absent, how far they will declare themselves concerning the Propositions for bringing in Money and Plate, &c. shall have Power to meet when they please; and that the First of July shall be the Day to bring in Horse and muster them. Ordered, That the Militia in Cambridgeshire shall be put into Execution on Thursday come Fortnight. Ordered, That Edmond Poxton, Printer, for printing of a false Paper, making the Lord Wharton General for Ireland, shall be summoned to appear here To-morrow. Ordered, That this House agrees to the Result of the Treaty of the Scotts Commissioners, as they were brought up from the House of Commons; and that an Article be drawn, that such Castles and Towns that the English take in Ulster, may not be taken from them by the Scotts. The Lord Admiral, and the Lord Robartes, and the Lord Mandevil, are to meet this Afternoon, to peruse what hath been (fn. 3) formerly voted touching the Militia, whereby to send an Answer concerning the Lord Keeper voting the Ordinance. "To the Right Honourable the Lord Francis Willoughby of Parham, at his House at Roth, with my Service. This, present." "To the Right Honourable his very good Lord, the Lord Francis Willoughby. These." "Our express Will and Command is, That you fail not to attend Us Personally forthwith, upon Signification made unto you, and Receipt of Our Pleasure on that Behalf, during our Abode in these Parts; and therefore We strictly require you, upon your Allegiance, that you depart not out of Our County of Lincolne, or suffer yourself to be any Ways engaged or kept from giving your ready Attendance accordingly, being thereunto called by Us, whilst We shall continue here, upon any Pretence or Order whatsoever, without Our Special Leave and Licence first obtained, as you tender Our highest Displeasure, and will answer the contrary at your Peril; for which this shall be your Warrant. "Given at Our Court at Yorke, the 24th May, 1642. "To our Trusty and Well-beloved William Booth, of Killingline." "Instructions for Mr. Ashton, Mr. Shuttleworth, Mr. Rigby, and Mr. Moore, Members of the House of Commons, now assembled in Parliament, and Committees to be sent into Lancashire, and for the rest of the Deputy Lieutenants of that County, for the Preservation of the Peace of that County. 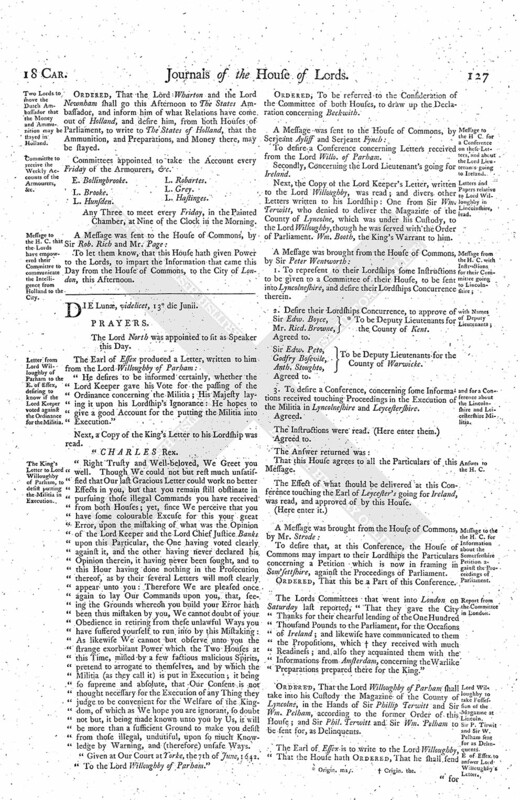 "Whereas it doth appear to the Lords and Commons now assembled in Parliament, that the King, seduced by wicked Counsels, intends to make a War against His Parliament; and for that it is not improbable that, under Colour of raising a Guard for His Majesty's Person, or some other Pretence, the Knights, Gentlemen, Freeholders, and Inhabitants, of the County of Lancaster, may be drawn together; therefore you, and every of you, shall take special Care, that the Ordinance concerning the Militia be forthwith put in Execution through the County; and the Sheriff and all other Officers and Subjects are hereby enjoined to assist you, and every of you, therein: And, if any Person whatsoever shall levy, or endeavour to levy, any Soldiers, or to draw or keep together the Trained Bands, or other armed Forces, of the said County, or any other Forces, by Colour or Pretence of any Commissions or Warrant from His Majesty, under the Great Seal, or otherwise, without Order or Consent of both Houses of Parliament; you, and every of you, shall, in the Name and by the Authority of both the said Houses, require and command all Persons to forbear the Execution of such Commission or Warrant; and the same to be delivered up unto you, or any of you, to be sent to the Speaker of the House of Commons: And you, and every of you, shall require and command all His Majesty's Subjects to forbear to obey any such Warrant or Commission; and you, and every of you, and all other the said Deputy Lieutenants, are hereby required to draw together such of the Trained Bands, and other Forces, of the said County, as shall be expedient, for the suppressing of all such Assemblies, and for the apprehending of all or any Person or Persons as shall, after Admonition and Command by you, or any of you, made to them, to forbear the Execution of any such Commission or Warrant, or the calling or gathering or keeping together of any such Forces or Assemblies, still persist in doing the same, as likewise such disaffected Persons as shall be found raising any Parties or Factions against the Parliament, to be sent up hither, to answer such their Offences, as to Law and Justice shall appertain. 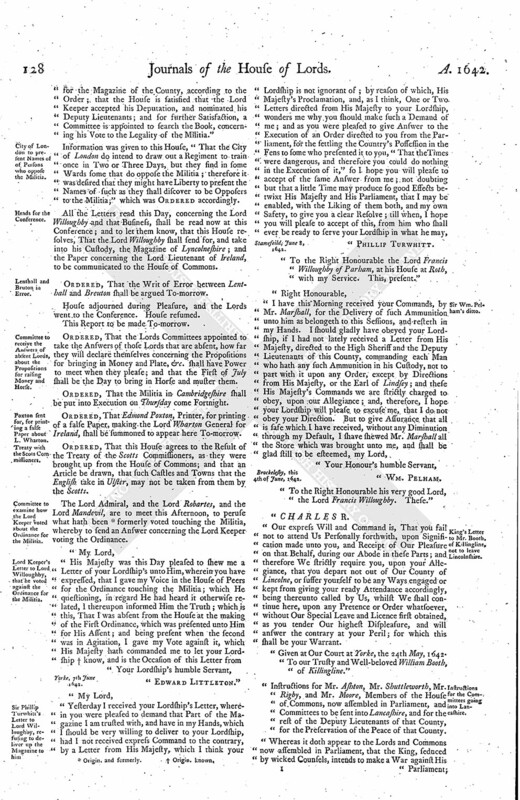 "And you the abovesaid Members of the House of Commons, and every of you, shall, in the Name of the Lords and Commons, require and command the Sheriff of the County of Lancaster, and the Justices of Peace, and every of them, to Publish throughout the said County the Declarations formerly published by both Houses of Parliament. "You, and every of you, shall further take Care, that such Resolutions and Orders of both Houses as have been, or shall be, delivered or sent down unto you, or any of you, be put in Execution; and shall require the Sheriffs, Justices of the Peace, and all other His Majesty's Officers and Subjects, to be aiding and assisting unto you for that Purpose. 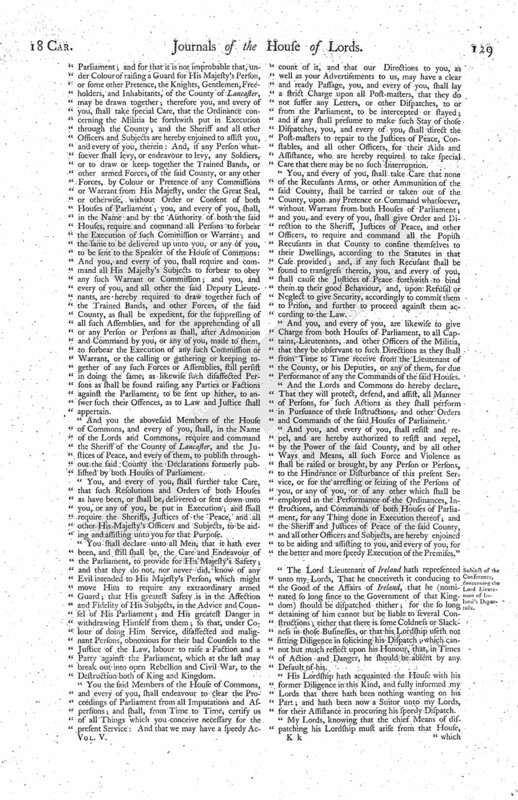 "You shall declare unto all Men, that it hath ever been, and still shall be, the Care and Endeavour of the Parliament, to provide for His Majesty's Safety; and that they do not, nor never did, know of any Evil intended to His Majesty's Person; which might move Him to require any extraordinary armed Guard; that His greatest Safety is in the Affection and Fidelity of His Subjects, in the Advice and Counsel of His Parliament; and His greatest Danger in withdrawing Himself from them; so that, under Colour of doing Him Service, disaffected and malignant Persons, obnoxious for their bad Counsels to the Justice of the Law, labour to raise a Faction and a Party against the Parliament, which at the last may break out into open Rebellion and Civil War, to the Destruction both of King and Kingdom. "You the said Members of the House of Commons, and every of you, shall endeavour to clear the Proceedings of Parliament from all Imputations and Aspersions; and shall, from Time to Time, certify us of all Things which you conceive necessary for the present Service: And that we may have a speedy Account of it, and that our Directions to you, as well as your Advertisements to us, may have a clear and ready Passage, you, and every of you, shall lay a strict Charge upon all Post-masters, that they do not suffer any Letters, or other Dispatches, to or from the Parliament, to be intercepted or stayed; and if any shall presume to make such Stay of those Dispatches, you, and every of you, shall direct the Post-masters to repair to the Justices of Peace, Constables, and all other Officers, for their Aids and Assistance, who are hereby required to take special Care that there may be no such Interruption. "You, and every of you, shall take Care that none of the Recusants Arms, or other Ammunition of the said County, shall be carried or taken out of the County, upon any Pretence or Command whatsoever, without Warrant from both Houses of Parliament; and you, and every of you, shall give Order and Direction to the Sheriff, Justices of Peace, and other Officers, to require and command all the Popish Recusants in that County to confine themselves to their Dwellings, according to the Statutes in that Case provided; and, if any such Recusant shall be found to transgress therein, you, and every of you, shall cause the Justices of Peace forthwith to bind them to their good Behaviour, and, upon Refusal or Neglect to give Security, accordingly to commit them to Prison, and further to proceed against them according to the Law. "And you, and every of you, are likewise to give Charge from both Houses of Parliament, to all Captains, Lieutenants, and other Officers of the Militia, that they be observant to such Directions as they shall from Time to Time receive from the Lieutenant of the County, or his Deputies, or any of them, for due Performance of any the Commands of the said Houses. "And the Lords and Commons do hereby declare, That they will protect, defend, and assist, all Manner of Persons, for such Actions as they shall perform in Pursuance of these Instructions, and other Orders and Commands of the said Houses of Parliament. "And you, and every of you, shall resist and repel, and are hereby authorized to resist and repel, by the Power of the said County, and by all other Ways and Means, all such Force and Violence as shall be raised or brought, by any Person or Persons, to the Hindrance or Disturbance of this present Service, or for the arresting or seizing of the Persons of you, or any of you, or of any other which shall be employed in the Performance of the Ordinances, Instructions, and Commands of both Houses of Parliament, for any Thing done in Execution thereof; and the Sheriff and Justices of Peace of the said County, and all other Officers and Subjects, are hereby enjoined to be aiding and assisting to you, and every of you, for the better and more speedy Execution of the Premises." "The Lord Lieutenant of Ireland hath represented unto my Lords, That he conceiveth it conducing to the Good of the Affairs of Ireland, that he (nominated so long since to the Government of that Kingdom) should be dispatched thither; for the so long detaining of him cannot but be liable to several Constructions; either that there is some Coldness or Slackness in those Businesses, or that his Lordship useth not fitting Diligence in soliciting his Dispatch; which cannot but much reflect upon his Honour, that, in Times of Action and Danger, he should be absent by any Default of his. "His Lordship hath acquainted the House with his former Diligence in this Kind, and fully informed my Lords that there hath been nothing wanting on his Part; and hath been now a Suitor unto my Lords, for their Assistance in procuring his speedy Dispatch. "My Lords, knowing that the chief Means of dispatching his Lordship must arise from that House, which is, by providing Money to pay the Soldiers, and Provisions necessary to the Train of Artillery, shall leave that wholly to them, to whom it belongeth; but likewise do desire that House to join with them, that, from both Houses, His Majesty may be moved, that the Lord Lieutenant's Instructions may be drawn up, and put in a Readiness, that Monies, and all other Things necessary for his Lordship's Dispatch, being provided, there may be no Stay or Retardment for Want of them." "It is this Day Ordered, by the Lords in Parliament, That the several Captains for the Militia of the City of London shall return the Names of such to this House as have, do, or shall refuse to furnish such Arms as they are charged withall, as also all such as find their own Arms, or are appointed to wear other Men's Arms, and either refuse or do not attend the Parliament Houses, or the several Trainings, when and as often as they have been, or shall be, required thereunto or by the Beating of the Drum summoned, that thereby such further Directions may be given therein, for the punishing of the said Offenders, as the Wisdom of this House shall think fit. Ordered, That Nic. Todd, Wm. Farrowe, Ric. Gyles, John Buttrice, and George Howard, shall be attached, for Contempt of an Order of this House, made in John Vanesdall's Cause, for Possession of the Fens.